Item 47 is a 2012 American direct-to-video short film featuring the Marvel Comics organization S.H.I.E.L.D. (Strategic Homeland Intervention Enforcement and Logistics Division), produced by Marvel Studios and distributed by Walt Disney Studios Home Entertainment on the home media release of Marvel's The Avengers. It is a follow up and spin-off of The Avengers, and is the third film in the Marvel One-Shots short film series. The film is directed by Louis D'Esposito, with a screenplay by Eric Pearson, and is set in the Marvel Cinematic Universe (MCU), sharing continuity with the films of the franchise. It stars Lizzy Caplan, Jesse Bradford, Maximiliano Hernández, and Titus Welliver, with Hernández reprising his role from the film series. In Item 47, two civilians come across a Chitauri gun and use it to commit crimes. The short helped lead to ABC ordering a television series spin-off, Agents of S.H.I.E.L.D., which began airing in September 2013. Jesse Bradford (left) and Lizzy Caplan (right), newcomers to the MCU, starred in the film. 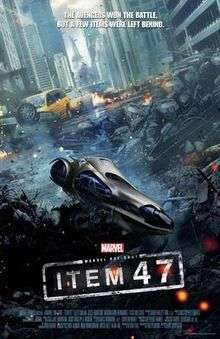 Item 47 was directed by Marvel Studios co-president Louis D’Esposito, written by Eric Pearson, and music by Christopher Lennertz. The short film, which was filmed over four days, has a runtime of 12 minutes, longer than the previous films, which were no longer than 4 minutes. Pearson and D'Esposito had the idea for the short after watching The Avengers and thinking, "New York is a mess. There must be weapons everywhere". Item 47 was released on The Avengers Blu-ray on September 25, 2012. It will be included on the bonus-disc of the "Marvel Cinematic Universe: Phase Two Collection" box set, which includes all of the Phase Two films in the Marvel Cinematic Universe as well as the other Marvel One-Shots. The collection features audio commentary from D'Esposito, Hernandez, Welliver and Bradford, and was released on December 8, 2015. Andre Dellamorte of Collider called Item 47 "silly". William Bibbiani of Crave Online said, "The short is largely a success: Hernandez, Bradford and Caplan are all in fine form although, Welliver seems saddled with a little awkward dialogue, particularly in regards to Coulson, which doesn’t entirely sell." Spencer Terry of Superhero Hype! said, "[Item 47] is easily the best one they've done, and I think that can be attributed to its length seeing as it's three times longer than the other One-Shots. With a longer run time, the short film doesn't have to rush to show us everything that it wants to - we get a clear understanding of both the S.H.I.E.L.D. perspective of the events and the robbers' point of view." Main article: Agents of S.H.I.E.L.D. Disney CEO Bob Iger greenlit a television series based on S.H.I.E.L.D. at ABC after watching Item 47. Marvel's Agents of S.H.I.E.L.D. was officially picked up in May 2013. Welliver, having been introduced in the One-Shot, reprises his role during the first season as a guest star. 1 2 3 4 5 6 7 Breznican, Anthony (July 3, 2012). "First Look: Marvel unveils top-secret 'Avengers' short film 'Item 47' – Exclusive". Entertainment Weekly. Archived from the original on April 29, 2014. Retrieved January 13, 2014. ↑ Burlingame, Russ (June 21, 2014). "Agent Carter One-Shot Composer Likely Headed to the TV Series". ComicBook. Archived from the original on September 27, 2014. Retrieved September 27, 2014. 1 2 Breznican, Anthony (July 11, 2013). "'Marvel One-Shot: Agent Carter' – First Look at poster and three photos from the new short!". Entertainment Weekly. Archived from the original on April 19, 2014. Retrieved April 19, 2014. ↑ Dellamorte, Andre (September 20, 2012). "THE AVENGERS Blu-ray Review". Collider. Archived from the original on January 14, 2014. Retrieved January 14, 2014. ↑ Dellamorte, Andre (July 14, 2012). "Comic-Con 2012 Review: Marvel One-Shots: Item 47". CraveOnline. Archived from the original on January 14, 2014. Retrieved January 14, 2014. ↑ Terry, Spencer (September 20, 2012). "Marvel's The Avengers Blu-ray Review". Superhero Hype!. Archived from the original on January 14, 2014. Retrieved January 14, 2014. ↑ Andreeva, Nellie (May 10, 2013). "ABC Picks Up Marvel/Joss Wheden's 'S.H.I.E.L.D.' To Series". Deadline.com. Archived from the original on May 10, 2013. Retrieved May 10, 2013. ↑ "Titus Welliver Set to Return as Agent Blake in Marvel's Agents of S.H.I.E.L.D.". Marvel.com. October 10, 2013. Archived from the original on March 12, 2014. Retrieved October 10, 2013.